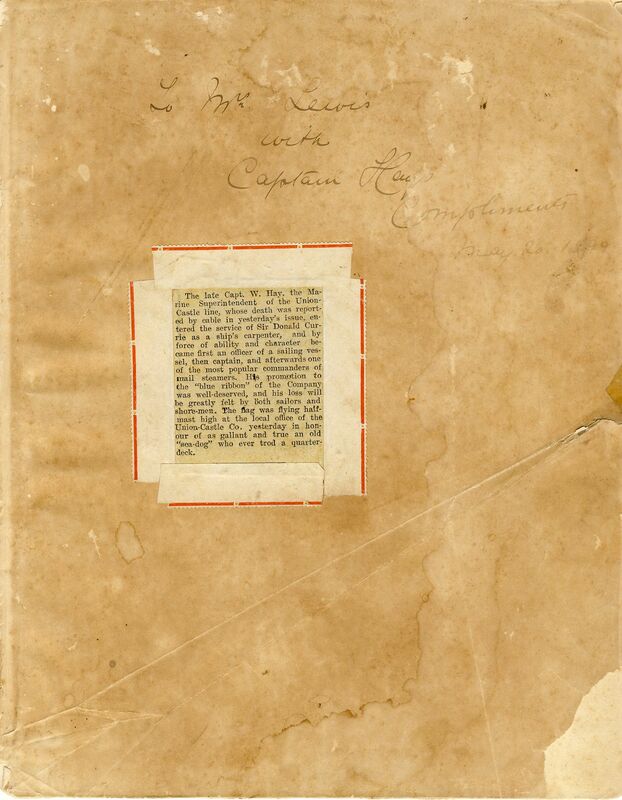 This site will contain the text of the memoirs of my late father Murray McGregor, who was born in Worcester, Cape Province, on 26 May 1908, when the Province was still a colony of Great Britain. He died in 2002, having lived through two World Wars, the unification of the four British colonies into the Union of South Africa, the exit of apartheid South Africa from the British Commonwealth of Nations in 1961, when it became a republic, and its increasing isolation from the rest of the world, and then the birth of a new, non-racial democratic country after April 1994, which once again joined the British Commonwealth of Nations. He was in many ways a man ahead of his time and also in so many ways a man very much of his time. His memoirs will show him to be a man of deep compassion and insight, with a sometimes firm grip on his own position in life and sometimes a less firm grip on that. He was a man of principle which earned him many friends and admirers and also some enemies, and it also made him sometimes seem quite stern and unbending. At other times his lively sense of humour would shine through to the delight of all who loved him , and we were many who did. Blessed with a photographic memory he was a mine of information and could remember masses of facts. This made him a formidable subject teacher, especially in his favourite subject of history. It also made him an expert on ships and shipping, with an encyclopaedic knowledge of ships of the Royal Navy, especially his great love, the famous Four-Funnelled Cruisers. 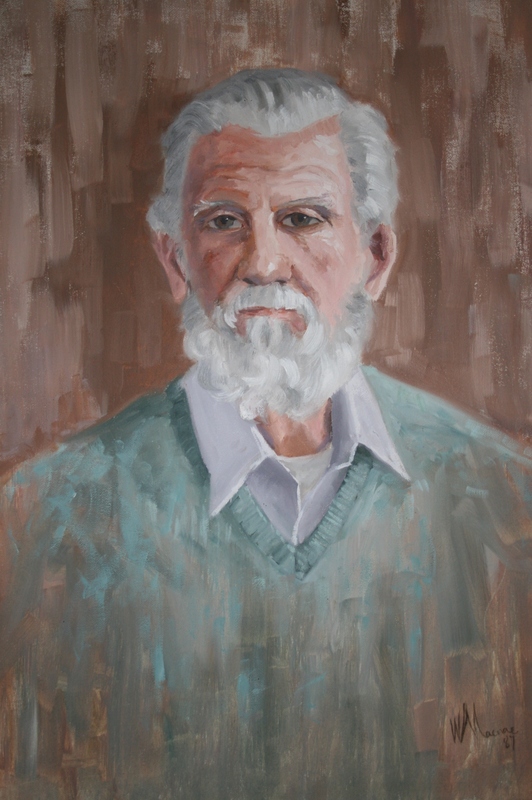 The portrait shown above was painted by Will Macnae in 1987, some months after the death of his beloved Margery (left), who died in December 1986. They had been married 51 years. 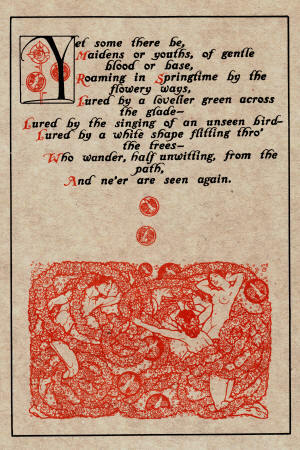 From John Masefield’s “Sea Fever”, one of my father’s favourite poems. Two themes run strongly through my father’s life: the sea, in a rather romanticised way often, and the Christian faith. He was deeply religious and committed to spreading the Word and the life of faith. In addition to these two themes he had a deeply-held belief in personal growth, that all people in whatever circumstances, can be better, can grow in knowledge and wisdom. This belief flowed directly out of his Christian convictions. TRIBUTE TO THE UNION-CASTLE COMPANY’S MAIL SERVICE. Sometime in the early 1970s Murray McGregor gave this talk to the KAFFRARIAN HISTORICAL SOCIETY in King William’s Town. The first steam-driven mailship was the Bosphorus, a fully-rigged vessel of 500 tons (smaller than our harbour tugs of today!) which came out in January 1851 after a passage of 40 days. To us this seems a very long time, but then it was easily the record for the Cape run; the sailing-ships of those days used to take three months or more on the trip. 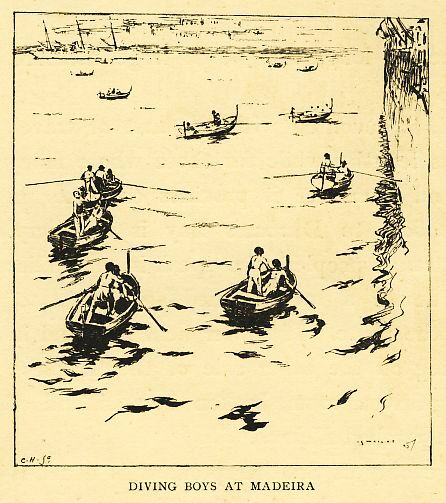 The famous Cape artist Bowler painted a water-colour of the arrival of the Bosphorus in Table Bay. Probably the finest ship of the ‘General Screw Steamship Company’, owners of the pioneer mail-steamer, was the Lady Jocelyn, called after wife of one of the directors of the firm. She was also a full-rigged ship, of 1 750 tons. It must be remembered that in those days all steamers were driven by a single screw-propellor activated by one engine, so that if anything happened to cause an engine break-down or the loss of the screw the ship would then have to complete her voyage under sail. Those old-fashioned engines were very uneconomical and used tremendous quantities of coal, which meant that sometimes all the fuel would be exhausted before the ship arrived at her destination and, again, she would be forced to depend on her sails. The Lady Jocelyn in 1853 brought from England to the Cape the constitution for the Colony, under which its first parliament was elected some months later. A painting of the ship was later hung in the Cape Parliament House, and was still there when he last visited the House some fifteen years ago. The evening of the 18th November 1857 was a noteworthy one. This was during the period of the Indian Mutiny, when ships were being rushed from England via the Cape to India, all laden with troops and stores. Amongst the sixty-four ships anchored in Table Bay were the two largest ships in the world, Brunel’s famous Great Britain of 3 400 tons, and the former P. & O. mailship, then an Admiralty transport, Himalaya, of 3 500 tons. (The former of these ships is still in existence in Bristol, carefully preserved in the dock in which she was built, 1839 – 43; the second remained an Admiralty store-ship until 1940, when she was sunk by German aerial bombs!). 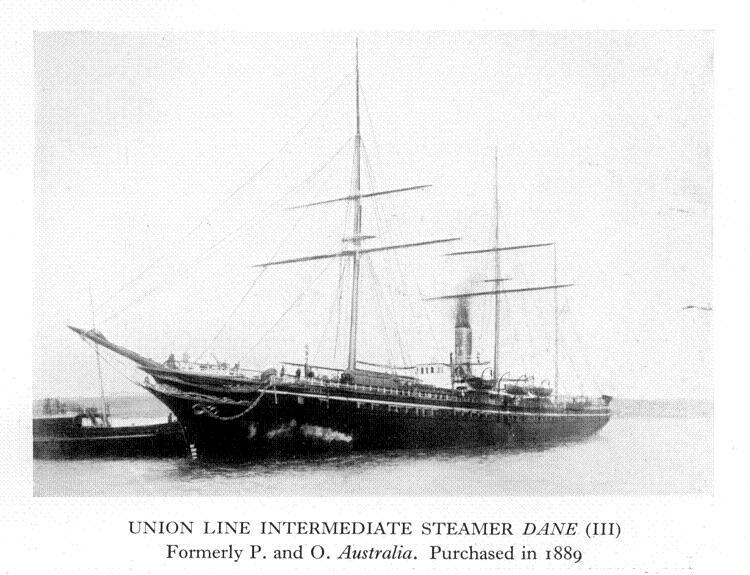 To have these famous ships there together was a unique occurrence; but more noteworthy still was the presence at anchor near them of a ship of only 530 tons, the Dane. This ship was the pioneer mail-steamer of the ‘Union Steamship Company’, a firm founded at Southampton in 1853 and the senior partner in what later became the ‘Union-Castle Mail Steamship Company’, so well known to most of us. The ships of the Union Line were called after nations or tribes. The Dane was joined by others such as Briton, Saxon, Roman and Cambrian (this last the first Cape mailship with a tonnage greater than 1 000!). 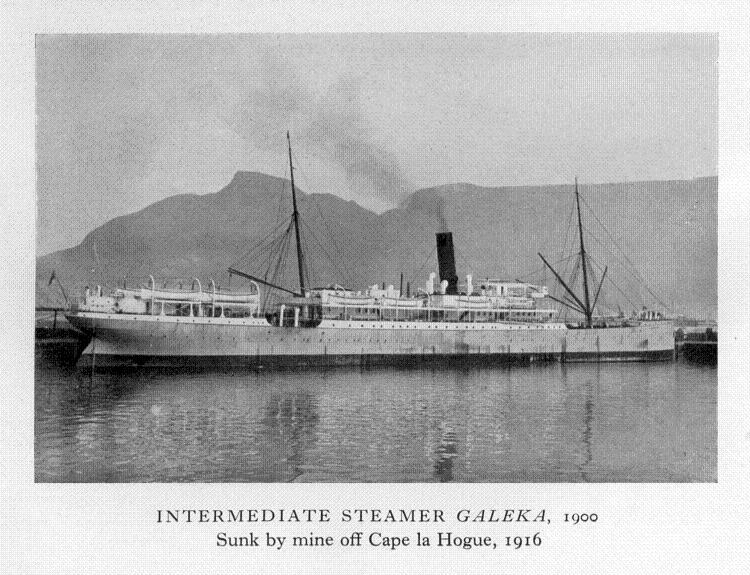 Later they used South African names for their coasting fleet and ‘intermediate’ steamers, such as Kafir, Zulu, Basuto, Gaika, Galeka. 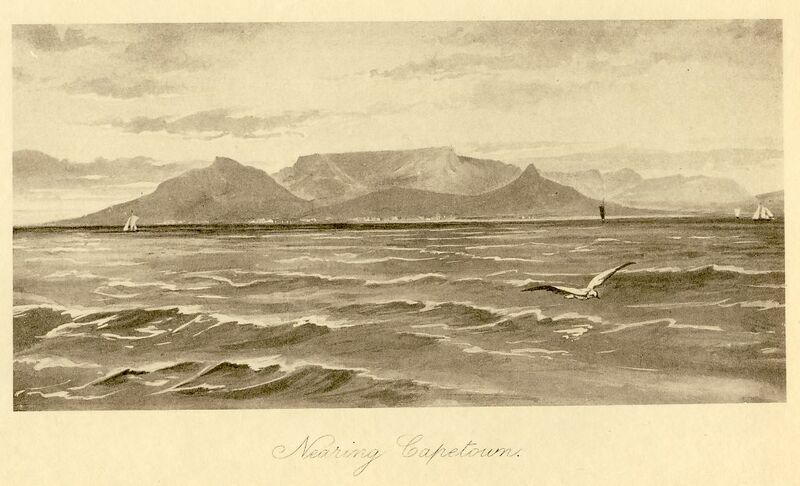 In 1872 the Scottish shipowner Donald Currie, well-known in South Africa for his gift of several gold ‘Currie Cups’ for inter-provincial sport, introduced his ‘floating castles’ on to the Cape run. The discovery of diamonds a few years before had brought such an upsurge of trade with the Cape that a new line could easily be profitable. So soon ships like the Conway Castle, Taymouth Castle, Balmoral Castle, Windsor Castle (first of the name) became well-known in the Cape and elsewhere. For some time they out-did the senior company, so that in 1876 the government divided the mail-contract between them, an event commemorated last year by the issue of a special stamp showing one of the early Castle mail-steamers. Under this contract the lines dispatched mailships on alternate weeks. So for the first time a weekly mail-service between Britain and the Cape was run. Apart from dislocations caused by the two world wars this has been maintained ever since. The next twenty years were marked by intense and extremely interesting (and sometimes amusing!) competition between the rival companies. The mailships grew bigger, faster and more powerful. 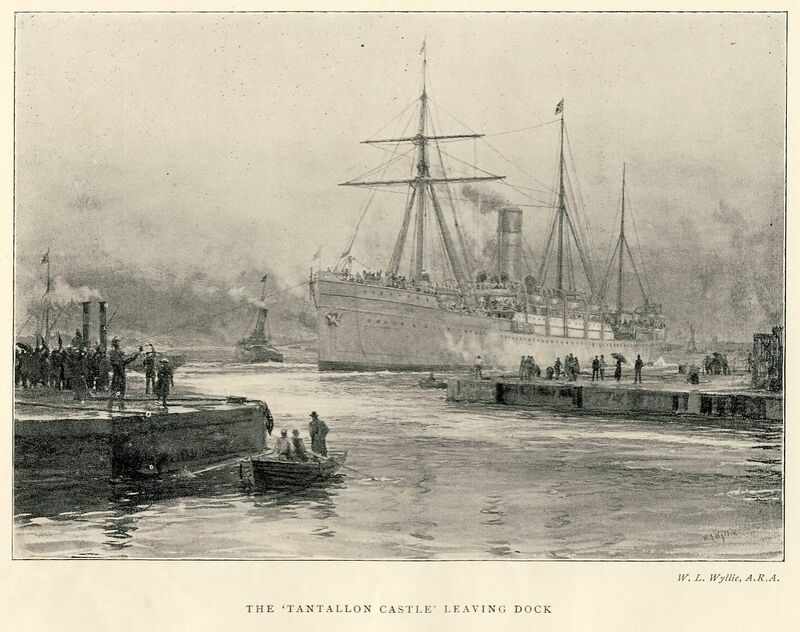 The decade 1890 – 1899 was especially exciting, when the Transvaal gold-rush saw many fine mailships built, most of them later well-known to me. Then in February, 1900, the two rivals at last agreed to unite and form that great company whose mail – and passenger – service has just ended. 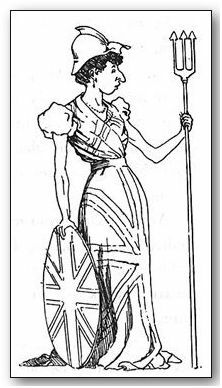 Two Scottish clans came together in South Africa in the 1860s and started a South African dynasty. An unknown artist painted a full-length portrait of the Rev Dr William Robertson, which was cut down to leave this portion. The first was the Robertson clan, established by the Rev Dr William Robertson, born on 13 July 1805 on his father’s farm Burn Riggs near Inverurie, near Aberdeen. He went to study at King’s College, Aberdeen at the age of 13. Three years later he had to abandon his studies as he became very ill with tuberculosis. At about the same time, many nautical miles to the south, the new English governor of the Cape Colony, Lord Charles Somerset, was keen to do something to improve the educational facilities available to people living in the colony, and also to address the shortage of properly trained and qualified ministers in the Dutch Reformed Church. He looked to Scotland to find people to assist in both these areas of work. Somerset commissioned an English minister, the Rev Dr. George Thom, who had joined the Dutch Reformed Church and was on furlough in the United Kingdom, to find suitable people in Scotland. Dr Thom visited Aberdeen and there engaged Church of Scotland minister the Rev Andrew Murray and, as a teacher, William Robertson. 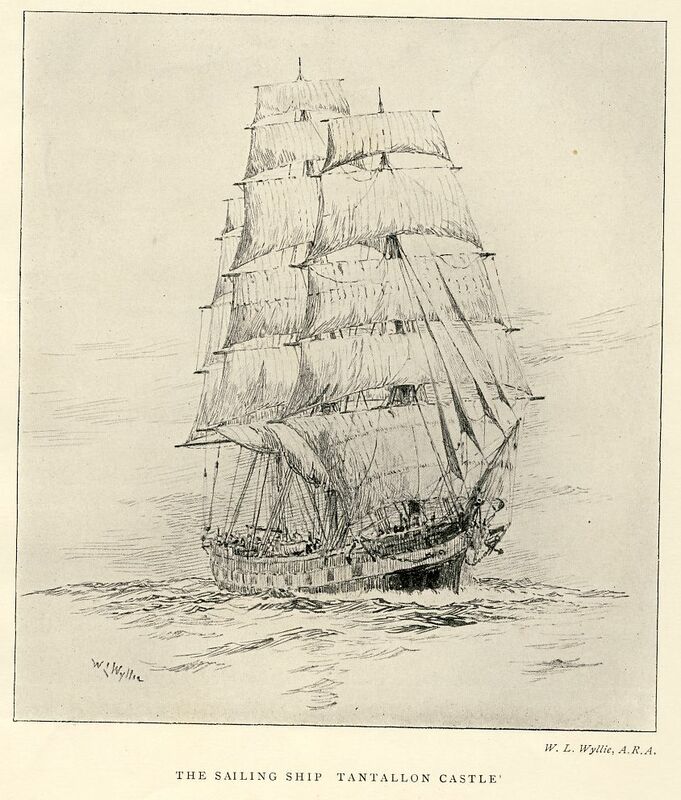 And so in February 1822 William Robertson, then still Mr. Robertson, in the company of the Rev Andrew Murray, set sail from London for a four month journey to South Africa in the 180 ton brig Arethusa. They arrived in Table Bay on 2 July, some 17 weeks after leaving the United Kingdom. Robertson’s first posting was to Graaff Reinet, where he was to open the Free English School. Andrew Murray was also sent to Graaff Reinet to become minister of the Dutch Reformed Church there. For the first two years Robertson stayed in the pastorie (parsonage) with Rev Murray. Robertson, in spite of his being only 17 years old, was very energetic and soon had the school up and running. The town at the time had a population of about 1800. On the advice of the Landdrost, Mr Andries Stockenstrom (later Sir Andries) Robertson started an evening school called the Evening Academy for Secondary Education. After five years, when his contract expired and his health had improved greatly, Robertson returned to Scotland to resume his studies at King’s College, Aberdeen, where he graduated with his M.A. in March 1828. He then continued studying divinity, first at Aberdeen and later at Edinburgh. Robertson was ordained a minister in the Church of Scotland in January 1831 after which he went to Utrecht in Holland to improve his Dutch, which he had started to learn in the Cape Colony. By October of the same year Robertson was back in the Cape Colony where he was ordained as a minister of the Dutch Reformed Church and appointed to first the church in Clanwilliam and two years later to the church in Swellendam. He was conferred with the degree of Doctor of Divinity by King’s College, Aberdeen, in October 1840. Meanwhile Dr Robertson married Eliza Truter, daughter of a well-known Cape family whose founder had arrived there in 1722 and was for many years the master gardener of the Dutch East India Company. Dr and Mrs Robertson had ten children, of whom nine survived. The one of relevance of this story is Elizabeth Augusta Robertson, born in Swellendam in 1839. This brings us to the connection with the other clan in our story, the McGregors. 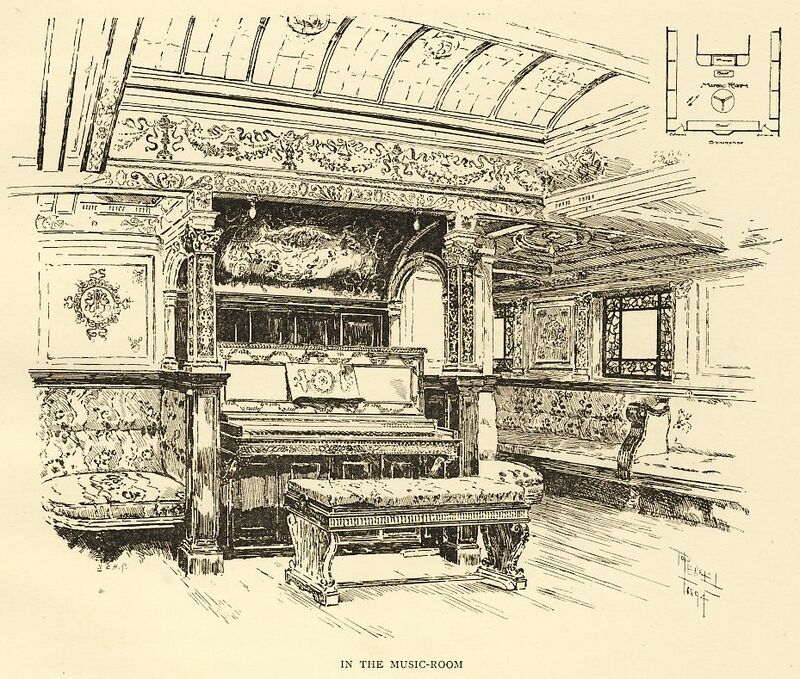 of Scotland, a merchant called Alexander McGregor ran an enterprise called “The Emporium”. He had a son, Andrew, born in 1829, who entered the Church of Scotland as a minister of the Free Tolbooth Church in Edinburgh. Dr Robertson was in Scotland in 1860 looking for more Scottish ministers to serve in the Dutch Reformed Church in the Cape Colony. Andrew McGregor joined the group of ministers Robertson had recruited and arrived in South Africa in 1862. He went to work in the Robertson parish. This parish was in the village called Hoopsrivier, which had been renamed Robertson in 1853, in honour of the great Doctor. 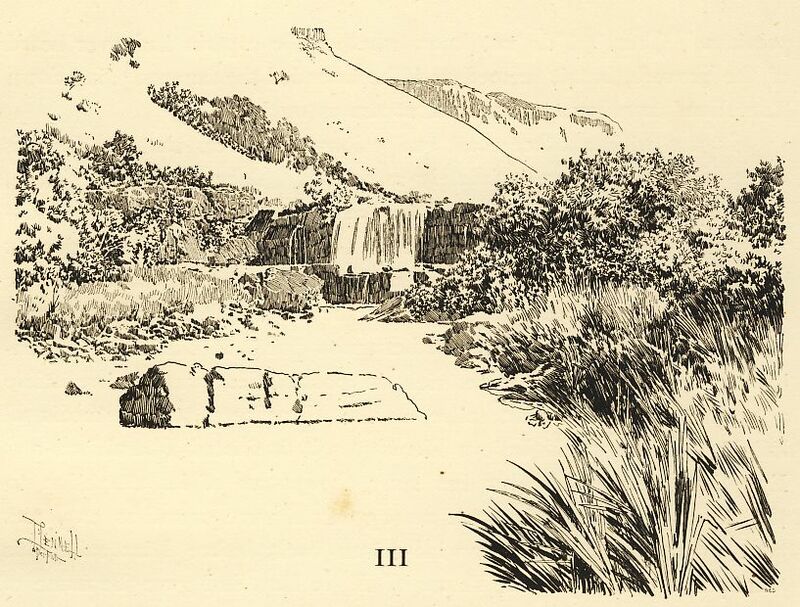 Three months after his arrival in the Cape Andrew McGregor married Elizabeth Augusta (fondly known in the family as “Lily”) and took his new bride to live and work with him in Robertson. 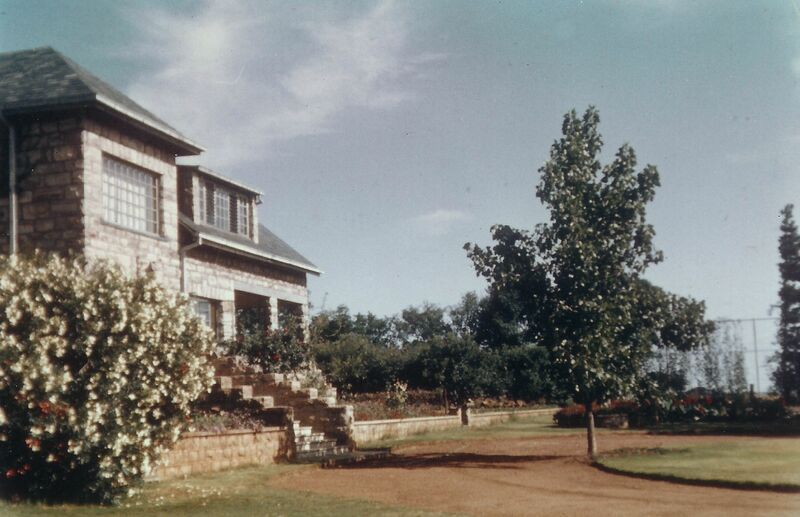 They lived there until Rev Andrew retired in 1902, when they moved to Cape Town, to live in the house he named “Rob Roy Villa” in Hillside Road, Tamboerskloof. While ministering in Robertson Andrew was very actively assisting in a neighbouring parish in the little town of Lady Grey. As a result of his work this parish became a separate congregation in its own right. The village was renamed McGregor in his honour in 1902. During their time in Robertson Andrew and Lily had ten children, of whom four died in childhood. All of the surviving children were interesting in their own rights. Rev Andrew McGregor (Snr) and his wife with (standing Lily, Andrew, Hetty and Mina and sitting to the right of the picture Alexander and, in front of him, John. They are on the sidewalk in front of the pastorie (parsonage) in Robertson. Taken circa 1895.
admitted as an advocate of the Supreme Court of the Cape Colony. Thereafter he became Staats Procureur (State Attorney) of the Orange Free State, later becoming a Judge under first the Republic and then the British colony and finally in the Union of South Africa after 1910. Judge McGregor married Elizabeth, the youngest daughter of the President of the Republic of the Orange Free State, President Jan Brand, in 1891. Their only son William (Willy), a Rhodes Scholar, was killed in action in Flanders during the First World War. Their oldest daughter Sybil married an Inner Temple barrister, Alan Corbett, who for many years was Commissioner for Inland Revenue of the Union. Their son Michael eventually became a judge himself and later the Chief Justice of South Africa. Andrew and Lily McGregor’s first daughter, born in 1869, was also called Elizabeth and also known as Lily. She married a Beaufort West farmer Mauritz de Villiers and they had five children before Mauritz died at the age of 37. Their first son Frank was a banker in Springfontein. Their second son Maurice studied at the Royal Military Academy in Woolwich, UK., and came home to South Africa to join the South African Army. During the Second World War he rose to the rank of Brigadier. The three daughters of Lily and Mauritz were Elise, who married John Otway Hayes (their son and grandson made names for themselves as professional golfers); Laetitia, who married Reginald Charles Rand, a Durban businessman; and Pansy, who married Allanby Henderson-Jones, a banker. 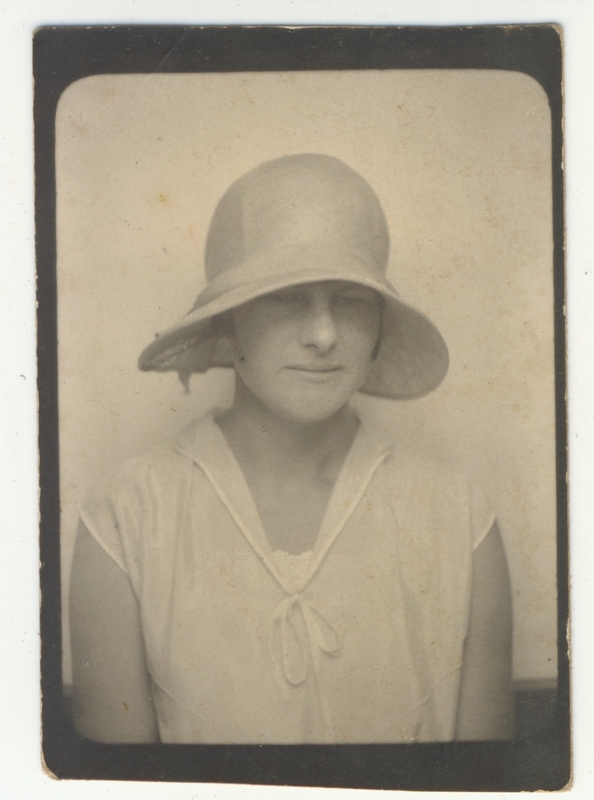 The second daughter, also born in 1869, to Andrew and Lily was Mina Hepburn Wallace McGregor, who married the Rev Gerrit du Plessis, a dominee of the Dutch Reformed Church in Calitzdorp and later Army Chaplain in Namibia (then still South West Africa) during the First World War. They had no children. Two Revs Andrew McGregor. Not sure who the little boy is. Now we come to my direct line of descent, with the second son born to Lily and Andrew McGregor, also called Andrew, second name Murray after the well-known Andrew Murray of Graaff Reinet, who was also his godfather. He was born in 1873 and after gaining his BA from the South African College studied at the Theological Seminary in Stellenbosch. After serving in the ministry in Cape Town he went on to minister to the concentration camp in East London during the Anglo-Boer War. From there he was called first to the church in Oudtshoorn and later to Three Anchor Bay, Cape Town. He retired from this church in 1939 and answered a call from the Presbyterian Church in Oudtshoorn, where he ministered until his death in 1943. Andrew McGregor Jnr married Maria (Miemie) Hofmeyr, who was the daughter of Ds Arend Hofmeyr of Hanover, Cape. Party Member of Parliament for Klerksdorp, being succeed in that seat by the forgettable Peet Pelser. Louise (usually called Lucy) and Alex farmed on the farm Dennegeur, near Klerksdorp, where I spent many wonderful holidays with my cousins Andrew, Jan, Marie, Helena, and Alex Jnr (usually called “Oubaas”). I remember Uncle Alex pulling a peanut plant out of the ground and explaining its features to me, my brother Chris and our father. This must have been in 1949 or 1950. I also saw him stitch up a long gash in the leg of one of his horses which had made an ill-considered jump over a barbed wire fence. Elizabeth, the second daughter, married Tielman Roos, the Parliamentary Librarian. This was the sister who was idolised by my father. She had studied in the United States before her marriage, and died after having one son, Johann. I never met her but knew Uncle Tielman and cousin Johann very well. The next daughter was Isabel Henrietta (Hetty) who became a teacher and later a lecturer at the Teacher Training College in Paarl. She never married, and after her father’s death her mother came to live with her there. She lived in three different houses over the years that I knew her there, and I came to know each of the houses very well. My brother Chris also boarded with her after he had completed his training on the SA Training Ship General Botha. He went to Paarl Boys’ High to write his matric prior to going to the South African College of Music in Cape Town. Hettie, Murray, Lucy with Miemie McGregor on the occassion of her 90th birthday. Paarl. a BA and then a B. Ed degree. His thesis for his B. Ed was a history of the amamFengu people of the then Transkei, which showed the way his mind was moving even then. He married Margery Morris, daughter of James H Morris, a pharmacist from George, in the Cape Colony. The youngest member of the family was Mary, who qualified in medicine, went to work at a mission hospital in the then Transkei, whyere she met and married John Smithen, a teacher at an Anglican mission school in Mthatha. They had three children, Louise, McGregor and Andrew. Miemie McGregor (left) with "Big" Aunt Hettie in Paarl. Back to the older generation of McGregors: Andrew and Lily McGregor’s last daughter, born in 1878, was Henrietta Maria, always known as Hetty. To the family she was “Big Aunt Hetty” to distinguish her from “Little Aunt Hetty,” my father’s sister, although “Big” aunt Hetty was physically very much smaller than “Little Aunt Hetty! This Hetty was in one of the first classes of women students to graduate from the South African College, in I think 1906. She did not marry, as it was thought that she was too frail to marry, although she outlived by many years all her siblings, dying in 1979 just before her 101st birthday. 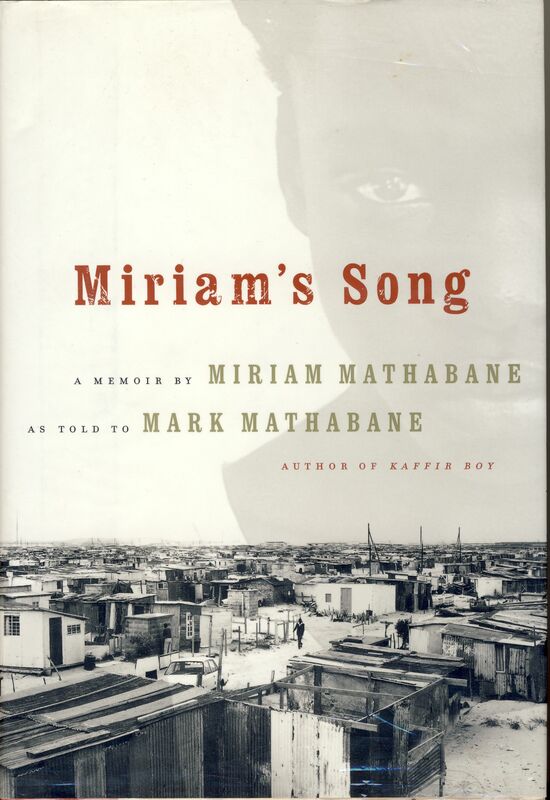 She was the family historian and all her life collected material relating to the family, most of which has been passed onto the Jagger Memorial Library at the University of Cape Town. Lily and Andrew’s last child was John Robertson, born in 1880. He studied medicine at Edinburgh and Dublin and became a general practitioner in George. It was on a visit to his Uncle John in George that my father met my mother! John married Marion de Wet and they had four sons. Two of their sons practised law in George, one joined a financial institution and one followed in his father’s footsteps and became a doctor, practising on the mines. John died in 1938.
newspaper article announcing the death of Captain W. Hay, then Marine Superintendant of the Union Castle Line. The name of Sir Donald Currie, the founder of the Castle Line, precursor of the well-known Union Castle Line, is still a household one, especially among white South Africans, as it was he who donated, in 1891, the eponymous “Currie Cup” for which rugby teams still vie, with their fanatical supporters. The Currie Cup competition is one of the oldest rugby competitions in the world today. Pennell and W.L. Wyllie were the most distinguished and well-known of the five artists who contributed to the book. Pennell was born in Philadelphia, Pennsylvania, in 1857 but lived for many years in London, where he and his wife were very close to their fellow-United States artist James McNeill Whistler, whose biography they wrote and published in 1908. William Lionel Wyllie was born in London in 1851 where he trained at the Heatherleys and the Royal Academy Schools. He won the Turner Medal in 1869. 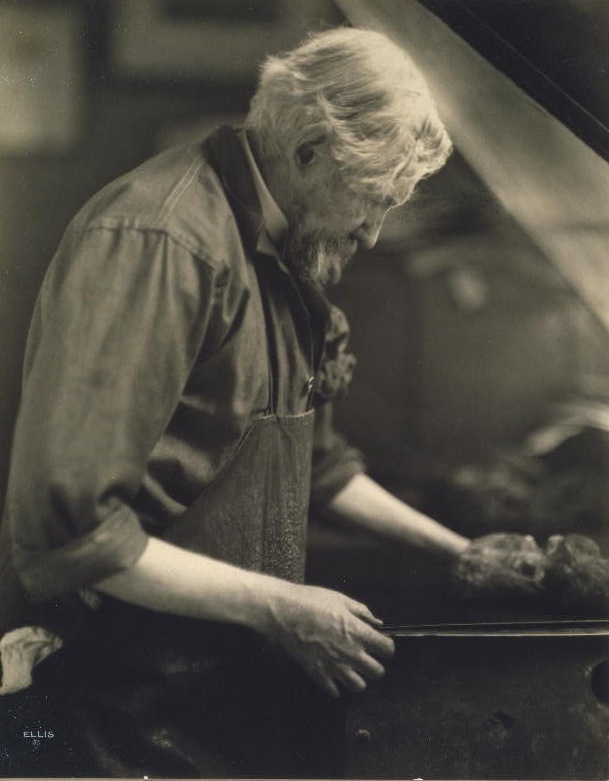 Wyllie lived for many years in Portsmouth and became known as one of the leading marine artists in England. His work, like that of Pennell, was widely shown and widely admired, especially in the early years of the 20th Century. The National Maritime Museum, Greenwich, holds a large collection of Wyllie’s works. 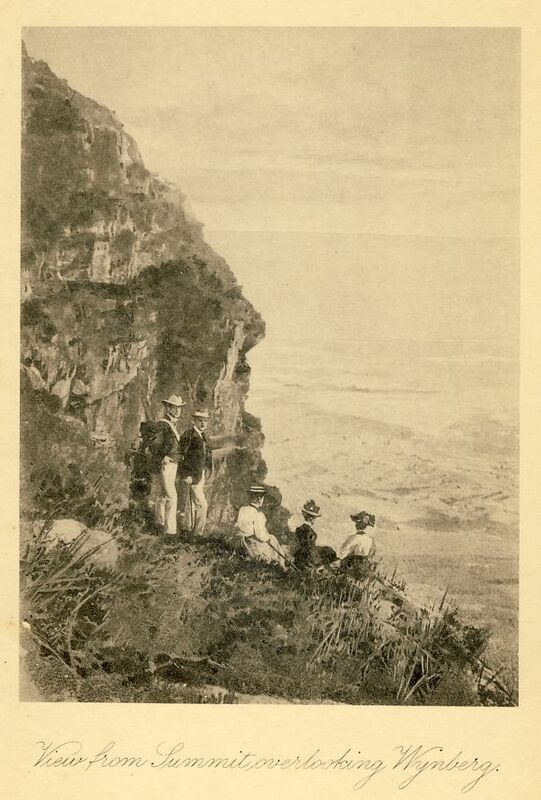 At about the same time a book of poetry entitled Table Mountain and sub-titled Pictures with Pen and Camera was published in Cape Town by J.C. Juta & Co. 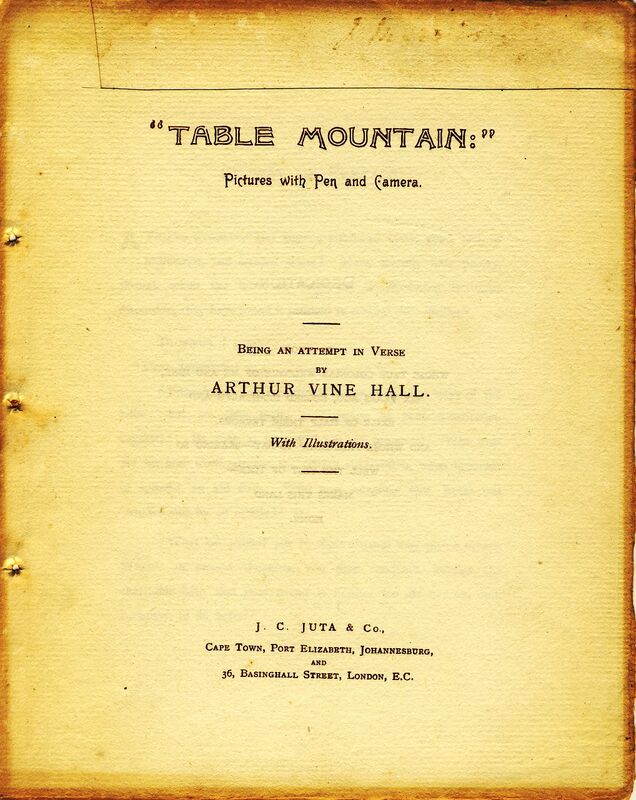 The writer of this book was Arthur Vine Hall, and it celebrates his arrival at the Cape some six years before. According to The Cambridge History of English and American Literature in 18 Volumes (1907–21). Vol. 14. The Victorian Age, Part Two this book was published in 1896. Before finding this reference the closest I could come to an estimation of the book’s publication date was the inscription in pen of the date 27 Nov 1897. This is written below an indication of the price of the book: 2 shillings! I assume that this is the date on which the book was bought by its original owner, or perhaps it is the date it was given by the buyer to someone else as a gift. 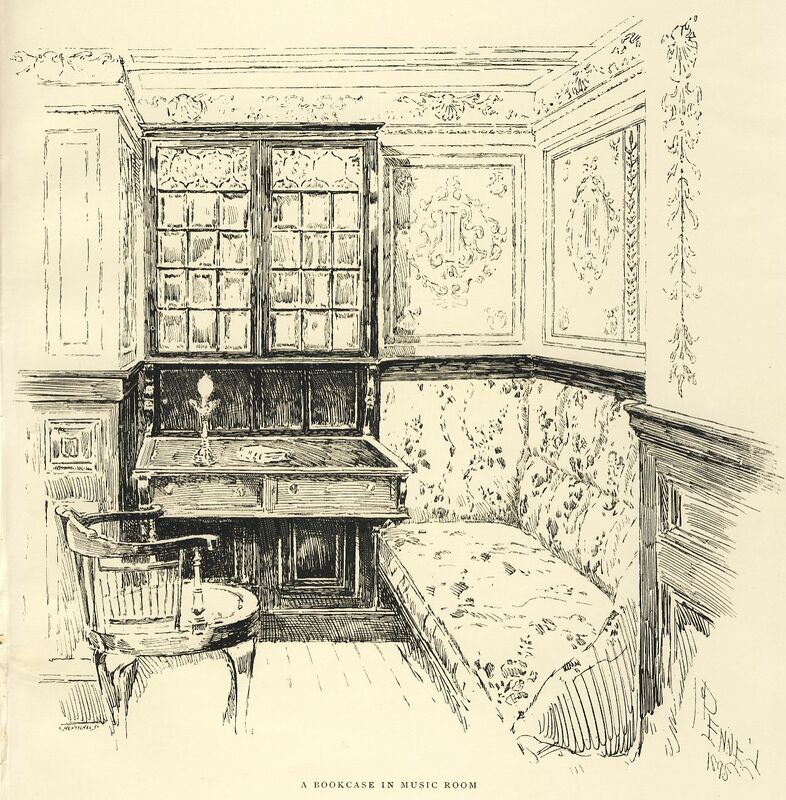 A note on the Contents page says that, “The majority of the illustrations are taken from views by Mr. S.B. Barnard of Cape Town, the others by Mr Jarman of Claremont.” Which are which though, is impossible to say, I believe. One reason for this article about these two books is that they were both in my late father Murray McGregor’s collection and are to me interesting examples of a particular Victorian genre of bookmaking marked by somewhat overblown and bombastic writing combined with rather charming illustrations. “O morning music of the wak’ning glade! O fiery noon and pine-wood’s purple shade! O timid Twilight, beautiful but fleet! Nor shake one diamond from the dewy grass. Another reason for writing about these two books together is that they both celebrate Cape Town and Table Mountain in a particular, somewhat romantic, but nonetheless interesting way. And so on, for page after page! Follows the hurrying footsteps of the Dark. 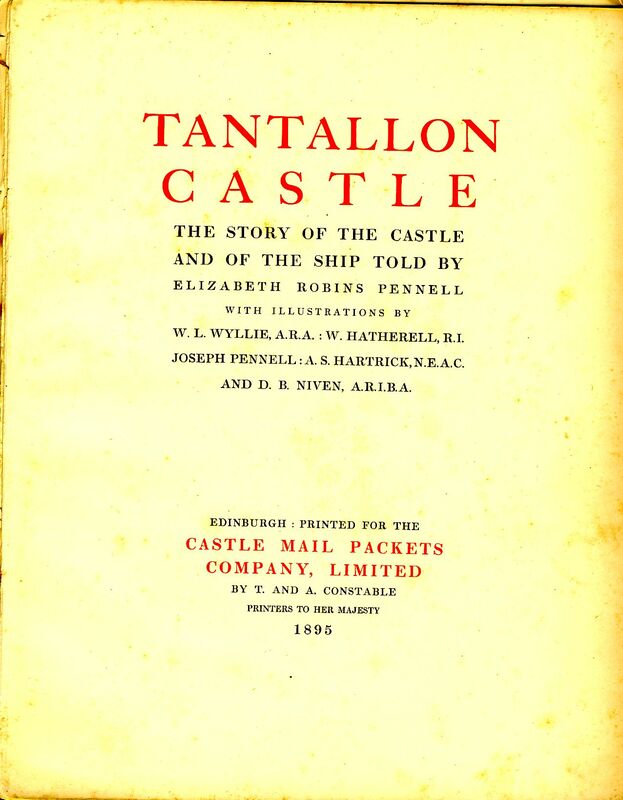 Of course, the Tantallon Castle book is about much more than Cape Town. The ship herself and the journey from London, around the Cape to Durban are substantial parts of the book, and make for fascinating reading (once one reads past the overblown language!). WAR OFFICE, S.W., 28th April, 1896. Passage to Cape Town having been provided for you in the s.s. Tantallon Castle, I am directed to request that you will proceed to Southampton and embark in the above vessel on the 2nd May by 12.30 p.m., reporting yourself before embarking to the military staff officer superintending the embarkation. You must not ship more than 55 cubic feet. I am further to request you will acknowledge the receipt of this letter by first post, and inform me of any change in your address up to the date of embarkation. You will be in command of the troops on board. The Evelyn Wood who signed this memorandum was at the time the Quarter Master General. 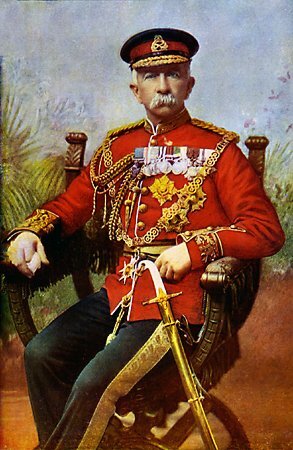 He had served in South Africa in both the Anglo-Zulu war of 1879 and the First Boer War. He had won the Victoria Cross at the age of 20 for rescuing a merchant from a band of robbers in India. He then goes on to describe the journey from Southampton in ways often very similar to the way Elizabeth Pennell had described her experience on board. 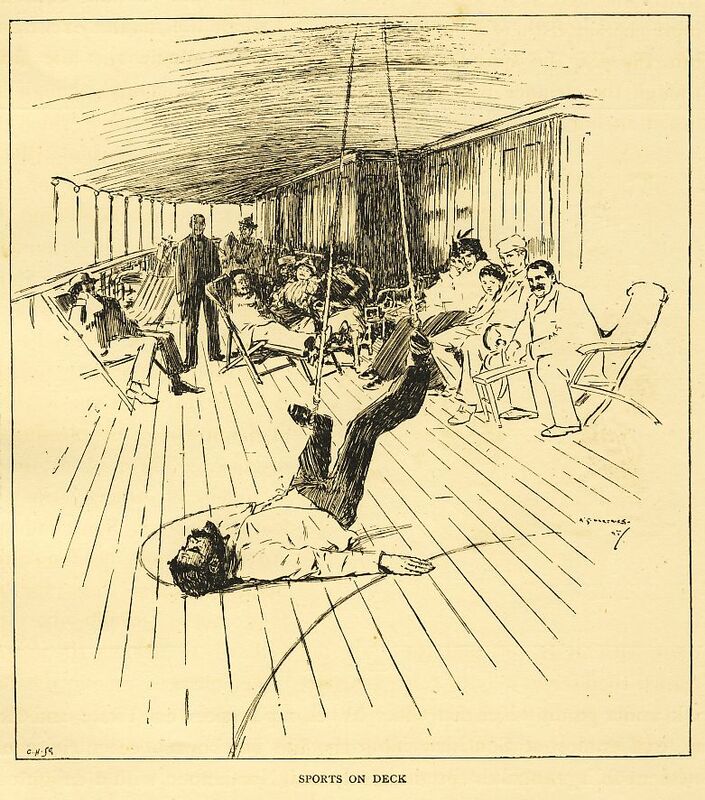 Powell, of course, puts it much more economically: “15th to 18th May.—Athletic sports, tableaux, concerts, ‑ and the fancy dress ball, and oar dinner party to the captain.” (I’m not sure if the “oar dinner party” is a typographical error or not?). “19th May.—At 4 a.m. I Awake with an uncanny feeling. All is silence and darkness. The screw has stopped, the ship lies like a log, the only sound is the plashing of the water pouring from the engine, and occasionally sharp footsteps overhead. “And looking from my port, I see, looming dark against the stars, the long, flat top of grand old Table Mountain—its base a haze from which electric lights gleam out and shine along the water. That phrase: “Malays and snoek fish everywhere” is just so redolent of the casual racism which I take to be characteristic of the Victorian era, with its perhaps unconscious equation of “snoek fish” and “Malays” as of the same order of creation, worthy of only a passing glance. 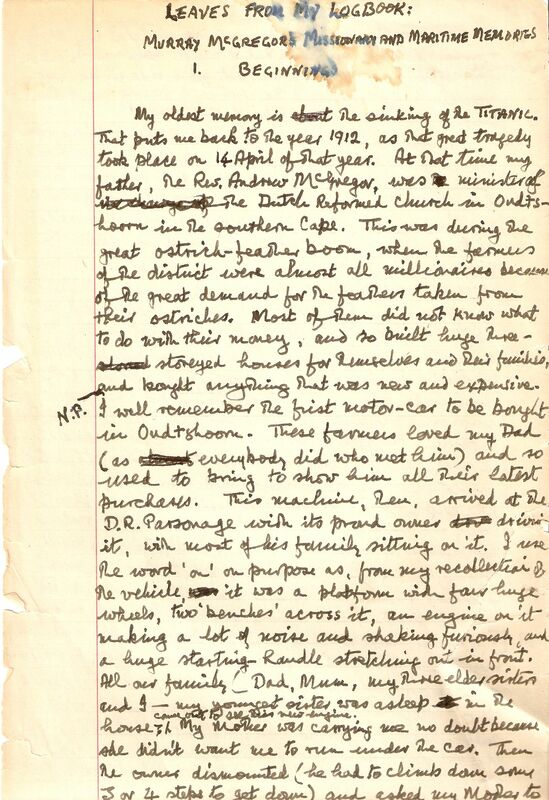 Pennell also shows something of the same attitude: “Zulus and Kaffirs gave the soldier his chance, lions and elephants his to the sportsman.” Such words have an incredibly insensitive ring to them, read just more than 100 years later. One wonders what the apparently straight-forward and practical Baden Powell made of such a room? 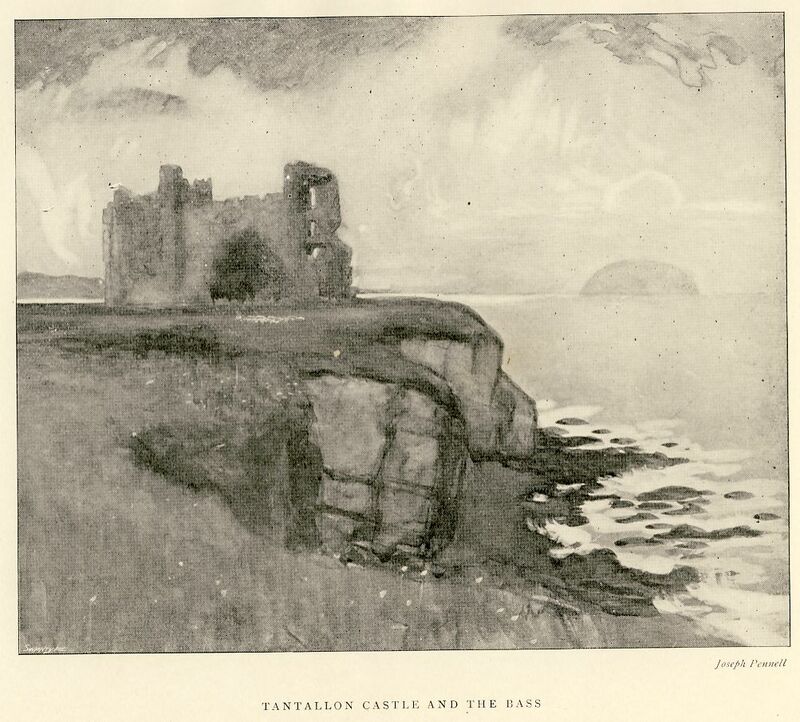 Unfortunately, even so grand a ship as the Tantallon Castle is mortal. 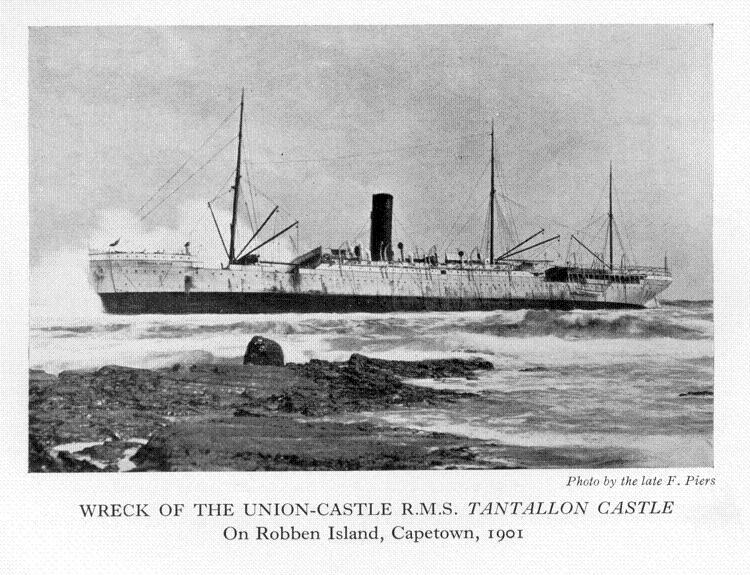 The end came for the ship on 7 May 1901, when she ran aground on Robben Island in dense fog. Not the sort of ending one would have hoped for for such a ship, but perhaps more dignified than the breakers yard. Bantu Education was thrust on the people of South Africa by the arrogance of the Afrikaner Nationalist establishment in the midst of increasing resistance to apartheid and all its ramifications. It was a particularly pernicious system with far-reaching and long-lasting political, social, economic and psychological impact on South Africans of all races. The Freedom Charter was a declaration issued by the Congress of the People at Kliptown, Johannesburg, on 26 June 1955. The Congress was a gathering of some 3000 delegates from all over South Africa called by the Congress Alliance. The Alliance was a grouping of a number of anti-apartheid organisations in South Africa. Its membership came from the African National Congress (ANC), then South African Indian Congress (SAIC), the South African Coloured People’s Organisation (SACPO), and the Congress of Democrats (the white element of the Congress Movement), the South African Congress of Trade Unions (SACTU) and the South African Peace Council. What Bantu Education meant to those who had devoted their lives to the education of Blacks in South Africa was a devastating destruction of their dreams and their perceived vocations. Many simply left in disgust. As devastating as Bantu Education was on the mainly white missionaries who had devoted their lives to the education of young Black people, the effects on the young Black people were of course infinitely worse. The long-term results of this skewed view and application of education came out in the 1996 Census figures (the first true census of all people in South Africa): one in five South African adults had received no formal education at all and only 6% had achieved tertiary level. For 25% of the population, at that time about 40.5 million, the highest level of education achieved was “some” primary school. At the time of the Census fully one third of the population was unemployed, more than 25% earned less than R500 per month. In most economic reviews of South Africa the skills shortage is listed as a major factor inhibiting growth. Frightening as these figures are, they actually don’t begin to tell the human story, the psychological effects of such an evil system as Bantu Education. South Africa in the second half of the first decade of the third millennium is facing social problems of unprecedented proportions. These include massive crime rates, drug abuse, family violence and violence generally. The integration of schools and other educational institutions is facing great difficulties and the learners themselves are caught up in uncertainty and disaffection. Of course, these questions cannot be answered, but my belief is that, yes, the social ills that wrack our society might well have been more tractable, and the whites who complain so bitterly about crime and their fears might have had more understanding of their black fellow-citizens, as of course blacks might have had more understanding of their white fellow-citizens. In the end, the damage done by Bantu Education is incalculable, but its effects are very tangible in the daily lives of millions of South Africans who have been blighted by this dreadful crime perpetrated against them. 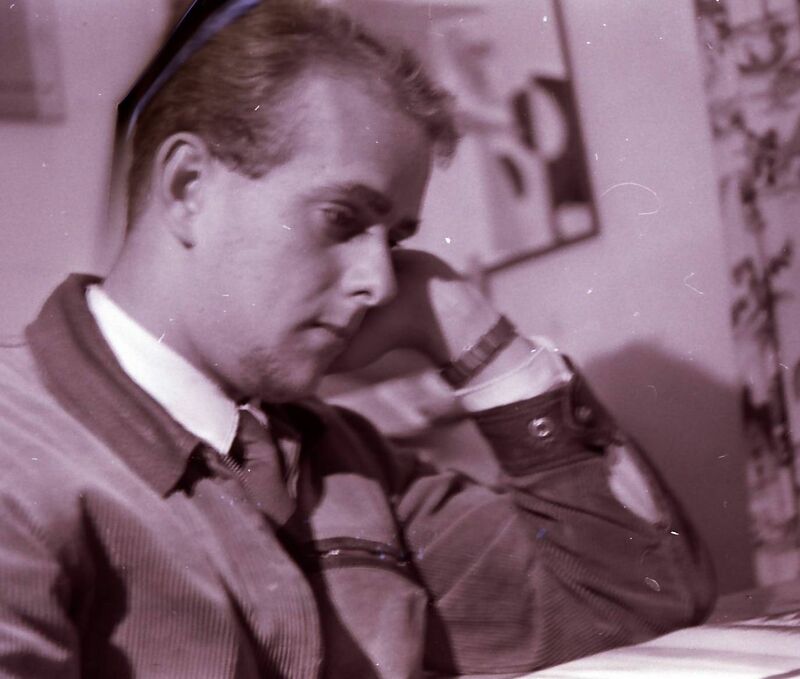 Dad’s memoirs suddenly look backwards: having arrived at 1963 we are taken back to 1952! In this year my brother Chris went as a cadet to the SATS General Botha on which our father had been a cadet in 1924 and 1925. 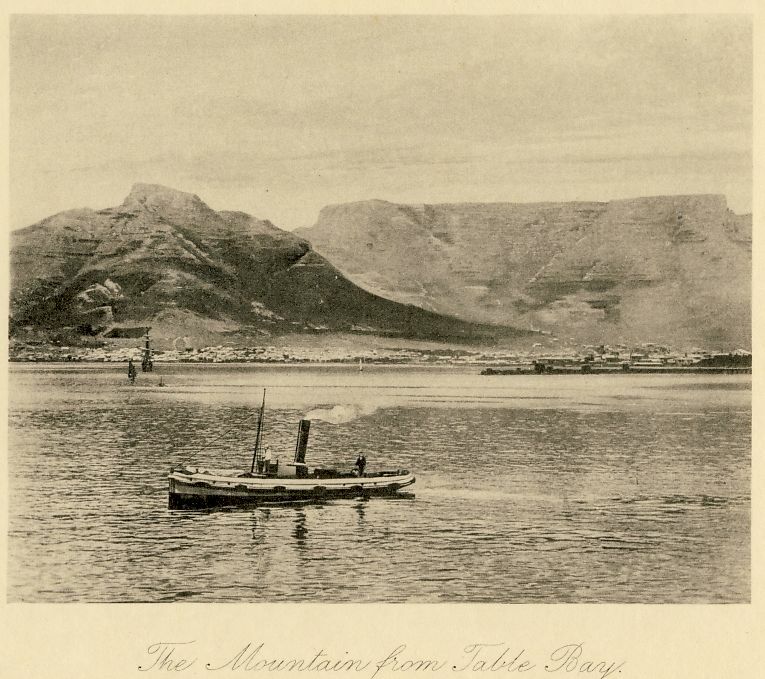 By now the old ship, the former HMS Thames, had been scuttled and the training ship was a “stone frigate” in Gordon’s Bay, a small bay off the larger False Bay, on the South Eastern side of the Cape Peninsular. 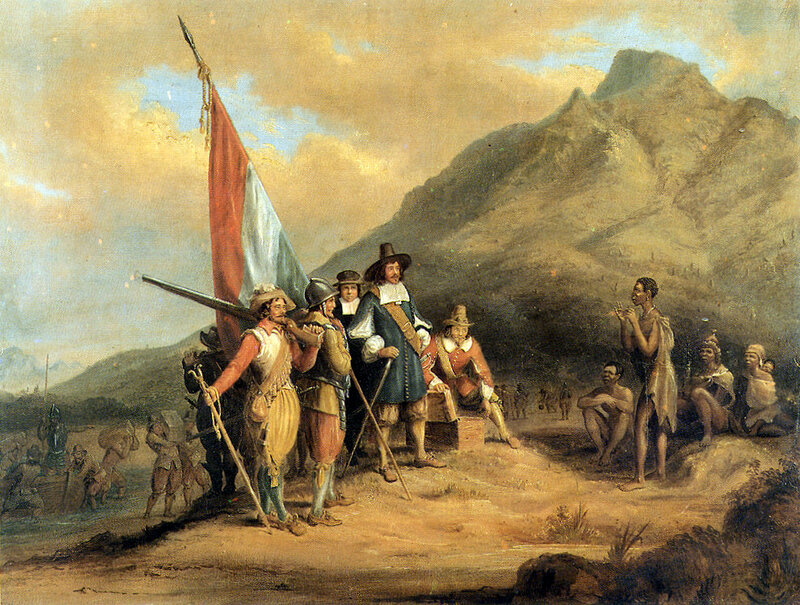 The rather fanciful depiction of the arrival of Van Riebeeck at the Cape in 1652, painted by Charles Bell in 1850. 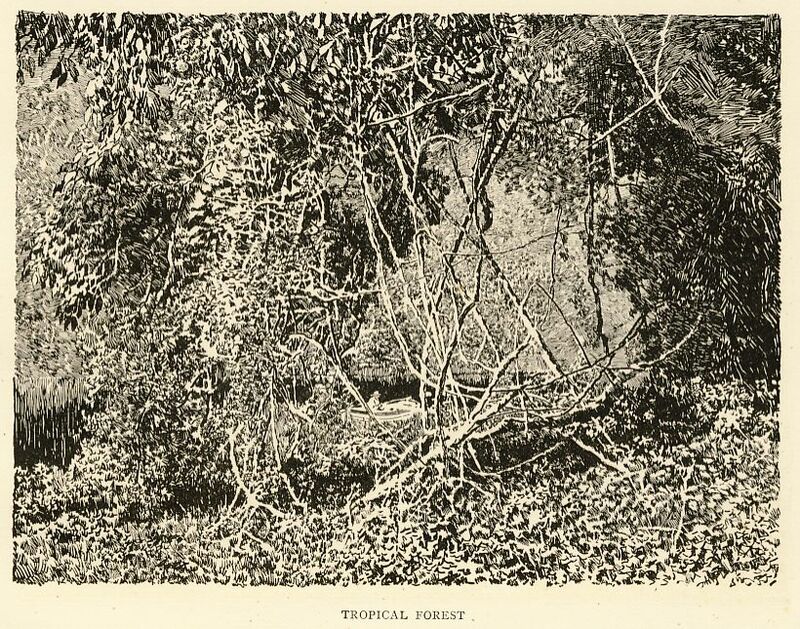 The original is housed in the South African Library. 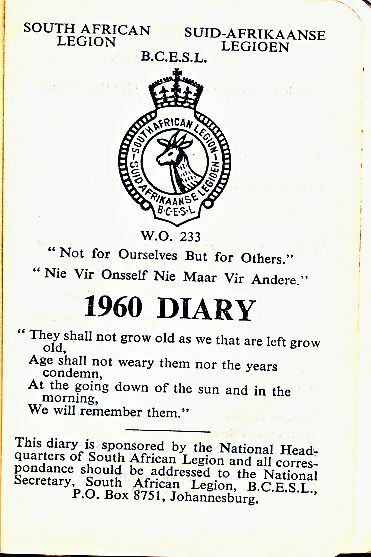 The year 1952 holds two memories for me: firstly it was the year of the 300th anniversary of the arrival of Jan van Riebeeck at the Cape in April 1652, where he was to set up a small outpost to provide provisions and fresh water for the ships of the Dutch East India Company on their way to and from India and the Far East. The Cadets of the General Botha were going to sail a replica of Van Riebeeck’s ship, the Drommedaris, into Table Bay and I was desperate to see the festivities that were planned. I was bitterly disappointed when my parents could not afford to let me go to Cape Town to see what was happening. The house at Dennegeur. The house was designed by my Aunt Lucy's husband Alex Kirstein and built of local stone by Italian prisoners of war during World War II. 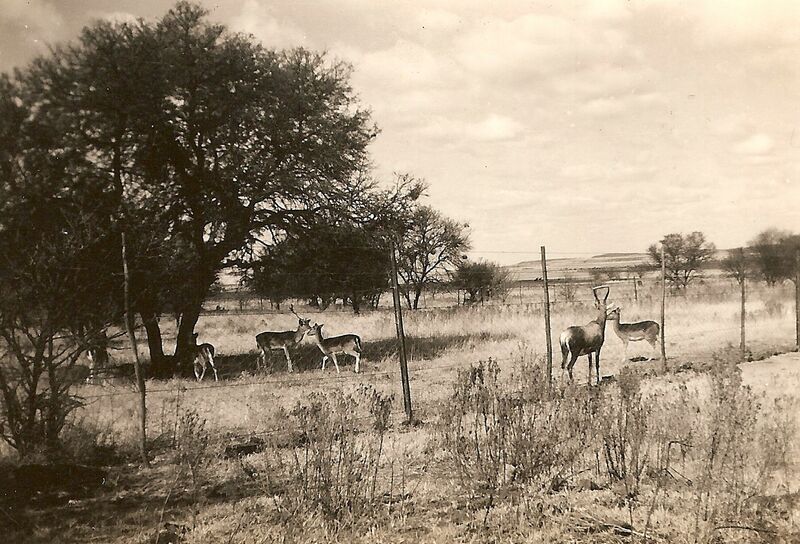 The second was that because they were going overseas I had to go to stay with my Aunt Lucy and her family on their farm Dennegeur in the then Western Transvaal (now part of the North West Province) near the town of Klerksdorp. This meant that I had to continue my schooling at the local farm school near Dennegeur and that was a huge shock to me as the school was very different from what I had been used to under the Cape Department of Education. I spent six months at Dennegeur and loved a lot of the farm life. There were buck on the farm, lots of birds and other small animals. One of the things that I remember the most was the plaintive call of the crowned plovers which abounded on the farm. It was a sound that came to represent my loneliness for me and still when I hear it it brings back those feelings of being alone and missing my parents so much. How I got to the farm I don’t recall except that it must have been by car. My mother drove mostly as Dad did not like driving. I guess the trip took two days and we would have stopped over in Bloemfontein and stayed at the old Polly’s Hotel. Chris came to join me at Dennegeur at the end of the academic year of the General Botha and after a few days together we caught a train to Cape Town where we would meet our parents on their return from the UK. Things I remember about this train trip is that it was the first time I realised that Chris smoked and secondly that Chris made me wash my face just before we arrived in Cape Town and that I just wiped the obvious parts around my eyes, nose and mouth and the rest of my face and neck was black with coal dust. I also remember seeing for the first time close up the points of the star of Cape Town Castle, and being very impressed with that. The train line still runs very close to them. We stayed with Queenie and Cherrie over Christmas and then took the long drive home to Blythswood. I don’t remember whether or not Chris came back with us, but I rather think not. He still had another year to do at the General Botha and would most likely have stayed on in Cape Town so as to get back to the ship in time for the start of the next year of his two years there. For me this year was important as it was my first year at Stellenbosch University where I had enrolled in the forestry course. I found university quite wonderful and I had a ball there, so much so that I did not make it academically. By the end of the year I was in any case disenchanted with the idea of becoming a forrester and so changed course to do a BA in 1964. I got home to Buntingville in late November 1963 and I well remember my mother coming into my bedroom early one morning and telling me that the US president, John F. Kennedy, had been assassinated the day before. 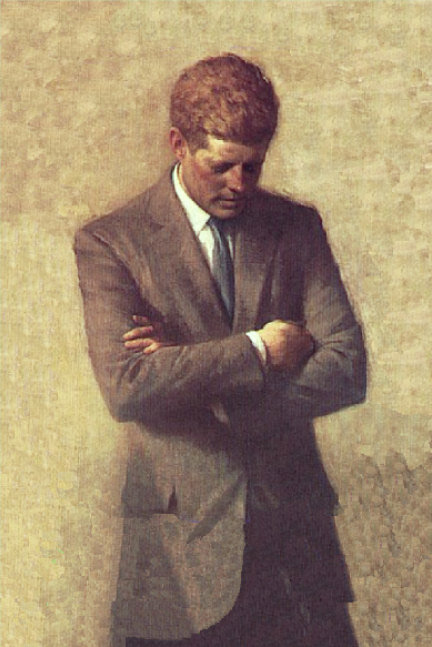 I was shattered as I had thought that JFK was a wonderful person who was going to lead the world to peace. My opinion of JFK has fluctuated over the years but my initial enthusiasm for him is being somewhat vindicated by a book that I have recently come across. It is written by a writer I have long admired, ever since discovering his great book Resistance and Contemplation (Delta, 1972) in about 1980, James W. Douglass. This book, published in 2008, is called JFK and the Unspeakable (Orbis, 2008). It is an amazing book about Kennedy’s “turn toward peace, and the price this exacted.” But that is the subject for another article. For me Kennedy’s murder was a tragic event and I was very upset by it. I think that the memory of the Cuban Missile Crisis of the year before, when I had been in the Naval Gymnasium at Saldanha Bay, was still very close and clear to me and I remember how intensely I had felt the threat of nuclear war at the time. So the assassination seemed to me to heighten the sense of peril facing the world at the time. Some of the chronology in this chapter is a bit mixed up. I did go to school in Bloemfontein because of my asthma but that was in 1959 already, when I was in Standard 9 (Grade 11). So when my father was demoted so summarily I was already at school in Bloemfontein. The routine was that I went to school by train at the beginning of each term. I caught the train in Queenstown. It usually left around five in the afternoon and arrived in Bloemfontein in the early hours of the following morning. This was a journey which I usually enjoyed very much as my mother would give me a packet of ‘goodies’ to take with me and also dinner and breakfast meal tickets and a bedding ticket so I was pretty independent and felt quite ‘grown up’ about it all. I left Blythswood in January 1960 fully expecting to return there at the Easter break, only to get the news toward the end of that term that my parents would be moving to Buntingville, a place I had not until then heard of. I found it all rather unsettling, to say the least and I got on the train in Bloemfontein at the end of term feeling rather insecure. After all, Blythswood had been my home for all of my conscious life really. And now I was not to see it again, certainly not to live there. The train journey back to Queenstown was pretty much the reverse of the trip up to Bloemfontein – the train left in the late afternoon and got to Queenstown in the early morning. This time though the journey had a bit of an edge to it which I had not before experienced. This time, instead of my parents collecting me from Queenstown I was to catch the “railway bus” to Mthatha (Umtata). I had often seen these great big reddish busses but never before that I can recall had I actually been a passenger on one. And certainly I had never before had to organize myself onto such a bus on my own. 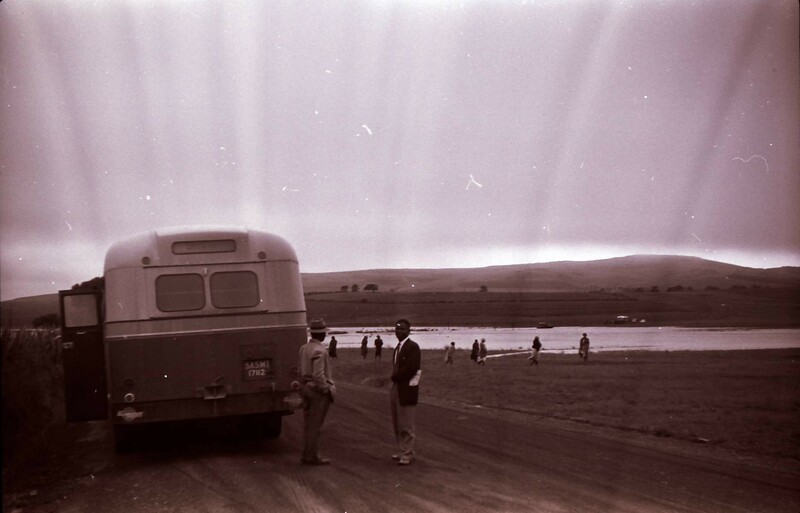 The trip was something of an experience for me as the bus typically drove through the deep rural areas and passengers got on and off with all manner of gear – chickens, bicycles, huge trunks. Then we came to a part where it was raining pretty hard and eventually got to a bridge that was submerged and so the bus just had to wait for the waters to subside, which took a few hours. I had my not very good camera with me and took several photos of all of this. My arrival in Mthatha was much later than expected and I finally got to our new home exhausted and strange. I can’t remember too much of the arrival, except that I know I felt very strange after the experience of the bus journey and then getting to an unknown place. At the end of 1960 I wrote Matric but did not do as well as might have been hoped – I guess the disruption of my previously very settled life had something to do with that. I know that my parents were struggling with their new circumstances as well as the political tensions that were roiling around that part of the then Transkei at the time, which my father doesn’t mention. In June of that year about 30 people had been shot and killed at Nqusa’s Hill in Pondoland. These men had been attending a peaceful, though technically illegal meeting on the hill, a meeting that had been going on for some time. According to eyewitnesses the hill top had been incessantly “buzzed” by aeroplanes which had prevented the attendees from hearing the speakers. Then a helicopter had landed sten-gun carrying policemen who were reinforced by other police who had arrived in trucks. The eyewitnesses told reporters that the attendees had put up their hands and shouted “We are not fighting”, but the police had opened fire and not stopped until there was no-one left standing to shoot at. This shooting became known as the Pondoland Massacre but little was known about it outside of Pondoland as the government had drawn a curtain of silence around the area. However, my parents, being sensitive people, knew what was going on and it disturbed them greatly. Of course these events also affected the students at the school. The Sharpeville shootings had also occurred that year, in March. So the whole country was in a state of high tension and the Government had declared a “State of emergency” which amounted to martial law. The Transkei was especially tense and whites were becoming panicky. A clandestine organisation known as Poqo was said to be spreading violence against whites and because of the Government’s clamp-down on reporting, rumours flew around at a great rate. The net result of all this for me was that I was enrolled the next year at Umtata High School to re-write my Matric. This was a new experience for me as Umtata High was a co-ed school. In my class was a fellow-student called Roy Joubert with whom I became very firm friends. He was more commonly known as “Jock” and we did a great deal together. It was as a result of our friendship that our respective parents also became firm friends. It turned out that the Jouberts had also known my aunt Mary, my father’s younger sister, who was married to the former head of St John’s College in Umtata, John Smithen, who had subsequently moved to be the head of Tiger Kloof High School near Vryburg in the then Northern Cape. So this was 1961, another year of great changes. The year of the referendum of which my father writes in the next chapter of his memoirs, the year of “Decimal Dan, your Rands Cents man” – the decimalisation of South Africa’s currency – the year of South Africa becoming a republic and its departure from the Commonwealth.